The Canadair CT-133 Silver Star has been one of the longest serving aircraft in the Canadian Armed Forces. The RCAF in took the first T-33 on strength, and there is no retirement in site for the type. 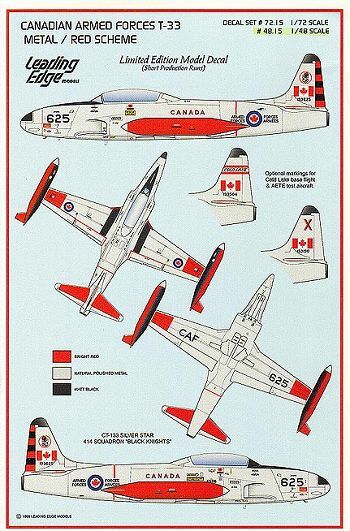 Throughout service the T-Bird has sported some neat paint schemes and Leading Edge Models of Canada continues to issue T-33 decal sheets for the modeler. Following on the heels of the "Silver Shark" scheme of VU-32, we now have the CAF’s other Utility Squadron’s entry. 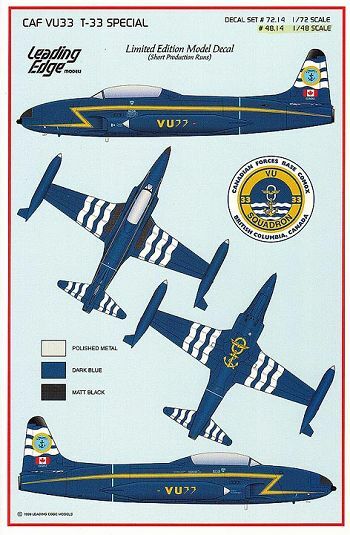 VU- 33’s Special is overall Dark Blue, with Blue and White wavy invasion stripes on the wings, vertical and horizontal stabilizers. The squadron emblem consisting of an winged anchor is on the tail fin, and a gold winged anchor is placed under the fuselage. To top off the scheme there is a gold cheatline for the fuselage and some VU-33 script for the wing tanks. Leading Edge provides all the marking needed for the aircraft, including additional intakes and exhaust ports necessary for the re-engined CAF CT-133. All necessary stencils are provided. The decals are spot on in register and the printing looks good. The black and white instructions provide excellent placement instructions for the decals, and painting details. A colour drawing of the scheme is included to clarify any confusion. My only complaint with the set is that it does not provide the nose radar dome that has been added to many CAF Silver Stars. Fortunately, it should not be too difficult to scratch build. All in all, a great set of decals for an attractive scheme. The second T-Bird sheet is for the standard hi-viz red and silver scheme that CAF CT-133s have been wearing until recently. Three options are provided on this sheet. The first is an aircraft of 414 "Black Knights" squadron based at CFB North Bay, Ontario. This aircraft carries a black and red tail band, and the squadron emblem on the tail fin. The second option is for an aircraft of the CFB Cold Lake Base flight. This aircraft carries a red, white, and black Cold Lake emblem on the tail fin. The last option is another aircraft from CFB Cold Lake, this time an aircraft of the Aerospace Engineering Test Establishment. This aircraft simply carries a red and black X on the tail fin. As with the VU-33 Special sheet, Leading Edge provides all the necessary marking for the aircraft, and the sheet is printed to the highest quality. Another must sheet for the T-33 fan or the CAF modeler. Leading Edge decal sets are available in all scales for which the subject aircraft is available in kit form. In the case of the T-33, both sheets are provided in 1/72 scale and 1/48 scale.